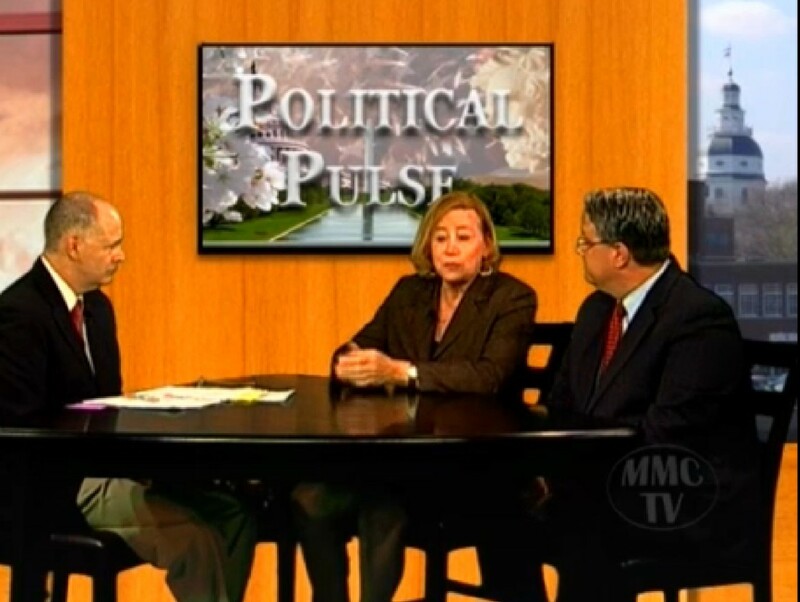 Photo above: On the Political Pulse cable TV show, host Charles Duffy, left, moderates a debate between Dana Beyer, center, and Sen. Richard Madaleno. An unusual political matchup pitting Maryland’s only openly gay senator against a transgender woman has emerged as one of the more fiery races before the June 24 primary. Sen. Richard Madaleno, the Democratic incumbent of District 18 in Montgomery County, faces a former county council aide, Dana Beyer, a retired surgeon and long-time transgender rights activist and lobbyist. There is no Republican running in this liberal district that lies partly inside the Washington Beltway, so the winner of the Democratic primary will be the next state senator. Madaleno has been tagged as one of the most liberal members of the Senate since his election to the seat in 2006, though Beyer has peddled herself as the real leftist candidate in the race, in the vein of the unapologetic U.S. Sen. Elizabeth Warren. Madaleno simply isn’t progressive enough, she said, specifically on economic issues. Madaleno has garnered consistently low opinions from organizations like the Maryland Business for Responsive Government, the National Rifle Association, and Maryland Right to Life, and positive endorsements from labor, environmental and progressive groups. He was also one of the few legislators to speak out against a cut to the estate “death” tax this legislative session, a measure supported broadly by the Democratic legislature leadership. Beyer condemned him for not pushing back on his colleagues enough, and said he and others had allowed the increase in minimum wage to become watered down by the right wing. Beyer and Madaleno have clashed publicly in multiple forums, including a televised debate on “Political Pulse”, a talk-show on Montgomery County Municipal cable, and most recently at a Democratic Club breakfast forum last Monday. Both cried foul that their respective campaigns have been attacking the other, and Madaleno accused Beyer of being “jealous” of his legislative successes. Despite gaining the backing of a contingent of local and state groups, including the cornerstone LGBT activist organization Equality Maryland, Madaleno has spent more than $33,000 of his campaign funds against Beyer, with more than $17,000 remaining — but he said he’s not worried that she might overtake his seat. “My record is my best response,” he said. Beyer’s leadership style is too forceful, Madaleno said, likening her to Tea Party U.S. Sen. Ted Cruz during the “Political Pulse” debate. Madaleno’s triumph during session was passage of Fairness for All Marylanders Act, which expanded rights for the transgender community. A petition drive to place the measure on a referendum ballot for repeal failed late May, allowing it to go into law. Led by Del. Neil Parrott R-Washington County and Del. Kathy Szeliga, R-Baltimore County, the opposition dubbed the it the “bathroom bill” because of the bill’s ability to allow transgender individuals to use the restroom of their self-identified gender. Beyer painted a picture of her battle not only against Madaleno, but the greater political ” establishment” also containing lobbyists. She carries more than $23,000 in her campaign finance account, according to the most recent filing, and has spent nearly $100,000. “Challengers don’t get endorsements from organizations because organizations want to maintain access,” she said. Carrie Evans, executive director of Equality Maryland, said Madaleno’s round-the-clock efforts ensured the legislation received the signature of Gov. Martin O’Malley. Evans cited Beyer’s attacks against Madaleno as “slanderous” and said Equality Maryland and the organization Beyer leads, Gender Rights Maryland, were divided on the handling and lobbying for the bill. A coalition, encompassing Equality Maryland, the American Civil Liberties Union of Maryland, National Center for Transgender Equality, and more than 50 other like-minded organizations supported the Fairness for All Marylanders Act. Beyer’s was not one of them, but did support the bill’s passage. Senate President Mike Miller apparently had little interest in the transgender bill, Evans said, but Madaleno’s relationship with Miller warmed him to vote for it. “Mike Miller’s progression on our issues, 95% of that is his relationship with Rich,” she said. Both contenders said overcrowding in Montgomery County schools is a pertinent problem in the district, as well as recent transit developments. Madaleno also said he recently he signed on with a pack of more than 200 General Assembly candidates who support raising the cigarette tax by $1 to $3 a pack next year.